The inspiration behind this project was the Canadian North. As three Canadian designers who are now getting opportunities to travel the world with our pieces we wanted to pay homage to our roots. The Canadian landscape is very diverse, and full of natural beauty, but as a group we decided we wanted to showcase what the north had to offer. From the northern lights, to the clear night sky, it provided us with a lot to draw from. Inspired by our northern Canadian landscape, and the common fascination with the night sky “True North” explores the human relationship to the earth, magnetic fields, and Canadian climate in a delicately visual way. “True North” is a 2-piece garment; the top portion will be composed of boning made from fibre-optic tubeing, woven within into a delectae strcuture. Powered by high-bright LEDs this top portion cicules through a variety of colours emulating the northern lights. The accompanying floor length flowing skirt houses an under layer of patterned paneled LEDs. This skirt is connected to a microcontroller and an accelerometer senor, when the wearer is facing north the front skirt panel will light up, as the wearer turns away from north the light strip will fade with a delay. Visually the skirt is completely lit up followed by a sequenced panel slow fade when the wearer spins in a circle. 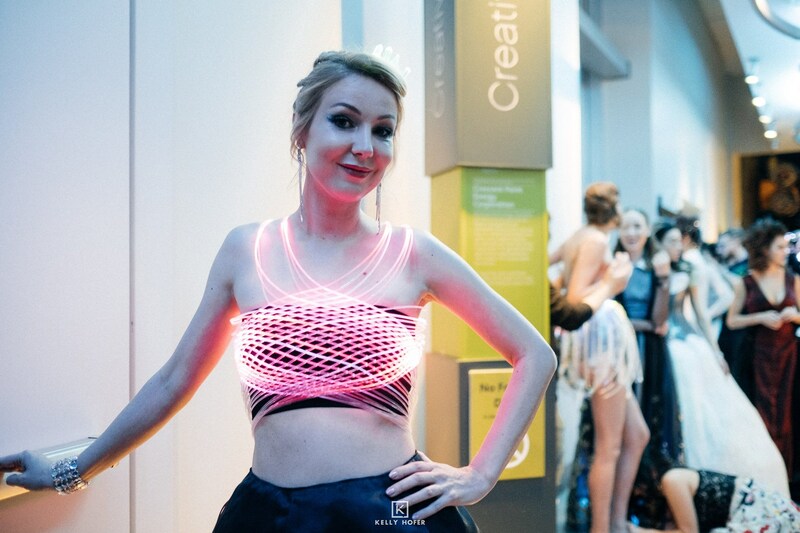 Since 2014, Phi: Illuminated Design has been deligted to have been working with MakeFashion a wearable tech organization that’s making waves in Canada and internationally within the innovative “Maker Culture” movement. With MakeFashion Phi : Illuminated Design has had the opportunity to showcase their performative wearable art/tech collections nationally and internationally at Beakerhead festival in Calgary, Rome MakerFaire, MakerFaire Bay Area in California, Fashionware New York, Dublin, Ireland, CES Vegas and Shanghai, Xiamen Fashion Week, China, and at a two-week art residency in Shenzhen, China. Phi: Illuminated Design is working on plans to iterate on some of their older designs as well as constantly looking for inspiration for our next fashion tech piece.